New Cervical Cancer Screening Guidelines: Was the Annual Pap Too Much of a Good Thing? Epidemiological studies have clearly established human papilloma-virus (HPV) infection as the central cause of invasive cervical cancer (ICC). This is the second most common cancer among women worldwide and the most common female cancer in large areas of the developing world where an estimated 80% of new cases arise (Parkin et al, 1999). Studies in 22 countries, coordinated by the International Agency for Research on Cancer (IARC), identified HPV DNA in almost all (99.7%) (of about 1000) cases of cervical cancer (Walboomers et al, 1999). Approximately 40 distinct HPV types are known to infect the genital tract and epidemiological studies to date suggest that at least 14 of these, called oncogenic or high-risk (HR) types, are significantly associated with progression to ICC (Bosch et al, 1995). Most of these HR types are phylogenetically related to either HPV16 (31, 33, 35, 52 and 58) or HPV18 (39, 45, 59 and 68) (Chan et al, 1995). Limited evidence suggests that their distribution may vary by region (Bosch et al, 1995). HPV vaccines hold great promise to reduce the global burden of ICC any potential vaccine be multivalent since prior infection with one type does not appear to decrease the risk of infection by another HPV type (Koutsky et al, 2002; Combita et al, 2002; Liaw et al, 2001). In this however, to collate all relevant published data to identify the most prevalent HPV types associated with ICC worldwide and within five geographic regions. Materials and methods Study selection Source material was selected from citations listed in Medline and ISI Current Contents databases and from references cited in the selected papers. Key search terms included: cervical cancer, HPV, human, female, and polymerase chain reaction (PCR). The review was limited to studies that included a minimum of 20 ICC cases; carcinomas in situ were excluded. Studies had to provide a clear description of the use of PCR-based assays to identify HPV DNA. Studies using nonamplified hybridisation methods only were excluded based on the reduced sensitivity of such methods in comparison to PCR (Gravitt et al, 1991; Schiffman et al, 1991; Guerrero et al, 1992). Furthermore, articles were only included if type-specific prevalence of at least one HPV type other than HPV6, 11, 16 or 18 was reported. For articles where study methods suggested that additional type-specific data were available, these data were requested from the authors (Yang et al, 1997; Eluf-Neto et al, 1994; Chaouki et al, 1998; Meyer et al, 1998; Chen et al, 1999; Lin et al, 2001). If data or data subsets had been published in more than one article, only the publication with the largest sample size was included. Data abstraction For each study, the following key information was extracted: country of sample; sample size; mean age; study year; distribution of cases by histological type; type of cervical specimen (e.g., fresh/fixed biopsies or exfoliated cells) and PCR primers used to detect HPV positive samples; type-specific and overall prevalence of HPV infection. Where available, data on HPV-specific prevalence were extracted independently for squamous cell carcinoma (SCC) and for adeno- and adenosquamous carcinoma (henceforth collectively termed ADC). Where histology-specific HPV prevalence was not reported, cases were classified as being of ‘unspecified’ histology. Each study was classified into one of five geographical regions: Africa, Asia, Europe, North America and Australia, or South and Central America. For studies comparing HPV prevalence across regions (Munoz et al, 1992; Bosch et al, 1995; Sebbelov et al, 2000), data were separated into their regional components. Studies included Of studies published up to February 2002 on Medline identified by our search criteria, 82 qualified for inclusion (no additional studies were included from ISI Current Contents). Three studies were conference abstracts containing the detailed information required for inclusion (Illades-Aguiar et al, 2000; Nindl et al, 2001; Rabelo-Santos et al, 2001). In the course of contacting authors, additional data became available for two studies expanded since the original publication (Burger et al, 1996; Andersson et al, 2001). Detailed information on the design of each of the 85 included studies is listed in the appendix. Estimation of type-specific prevalence HPV prevalence data were expressed as percentages of all cases tested for HPV. Multiple infections (3.7% of all ICC cases) were separated into constituent types, thus type-specific prevalence represents that in either single or multiple infections. Cases with specimens considered to be inadequate for PCR testing were excluded. Type-specific prevalence is presented for the 18 most common HPV types as identified by this review (HPV types 6, 16, 18, 31, 33, 35, 39, 45, 51, 52, 56, 58, 59, 66, 68, 70, 73 and 82 also known as MM4, W13B or IS39) in order of descending prevalence for each subgroup analysis. Consensus PCR primers My09/11 (Bernard et al, 1994), GP5+/6+ (Chaouki et al, 1998) and SPF10 (Kleter et al, 1999) were considered to amplify all 18 HPV types, L1C1/L1C2 (Nakagawa et al, 1996) to amplify all types, but HPV73 and 82, GP5/6 to amplify types 6, 11, 16, 18, 31, 33, 35 and 45 only (Roda Husman et al, 1995), and pU1M/2R (Harima et al, 2002) to amplify types 6, 16, 18, 31, 33, 35, 52, 56, 58 and 59 only. For other consensus and type-specific PCR primers, only those HPV types specified in the individual reports were considered amplifiable. For HPV-specific prevalence, only studies testing for a particular HPV type contribute to the analysis for that type, and therefore sample size varies between the type-specific analyses. Statistical analyses Sources of variation in overall HPV prevalence were investigated by unconditional multiple logistic regression analysis (Breslow and Day, 1980). The final model included the following sources of variation: geographical region, histological type of ICC, type of specimen for HPV DNA testing, and type of PCR primers used. Mean age and study year were found not to be significantly related to overall HPV prevalence. Adjustment of overall HPV prevalence for these variables was done using the adjust command in Stata version 7.0, based on probability estimates from the logistic regression model. Confidence intervals for overall HPV prevalence were calculated assuming the nonindependence of cases within the same study using the cluster option in Stata (White, 1980). P-values comparing the prevalence of particular HPV types in subsets of ICC cases refer to χ 2 tests. Results Meta-analysis of overall HPV prevalence A total of 10 058 ICC cases from the 85 identified studies were included in this meta-analysis of HPV prevalence (Table 1 Table 1 Region- and histology-specific distribution of included studies and ICC cases Number (%) of cases with histology-specific HPV data Region No. of studies Countries represented No. of cases SCC ADC Unspecified Africa 6 Algeria, Benin, Guinea, Mali, Morocco, Senegal, South Africa, Tanzania, Uganda 609 204 (33.5) 21 (3.4) 384 (63.1) Asia 28 Mainland China, India, Indonesia, Japan, Korea, Malaysia, Philippines, Taiwan, Thailand 3091 2273 (73.5) 381 (12.3) 437 (14.1) Europe 32 Austria, Czech Republic, Denmark, Finland, France, Germany, Greece, Greenland, Holland, Hungary, Ireland, Italy, Norway, Poland, Russia, Sweden, UK 3336 2010 (60.3) 603 (18.1) 723 (21.7) North America and Australia 13 Australia, Canada, USA 1562 914 (58.5) 450 (28.8) 198 (12.7) South and Central America 12 Argentina, Bolivia, Brazil, Chile, Colombia, Costa Rica, Cuba, Honduras, Mexico, Panama, Paraguay, Peru 1460 424 (29.0) 53 (3.6) 983 (67.3) Total 85 10 058 5825 (57.9) 1508 (15.0) 2725 (27.1) HPV=human papillomavirus; ICC=invasive cervical cancer; SCC=squamous cell carcinoma; ADC=adeno/adenosquamous carcinoma. ). A majority of cases came from studies performed in Asia (31%) and Europe (33%), with African studies representing the smallest proportion of cases (6%). HPV prevalence was reported stratified by histological type for 73% of the cases: 5825 SCC cases and 1508 ADC cases. In total, 12 studies included only SCC and seven studies included only ADC. Adjusted overall HPV prevalence ranged from 79.3% in Asia to 88.1% in North America and Australia, but did not differ significantly between regions (Table 2 Table 2 Prevalence of HPV by region, histological type, HPV DNA specimen and PCR primers used Variable No. of studies No. of cases Crude HPV prevalence (%) Adjusteda HPV prevalence (%) 95% confidence intervals Region Africa 6 609 88.8 86.5 (76.4–92.7) Asia 28 3091 83.1 79.3 (73.7–84.0) Europe 32 3336 85.9 86.7 (82.5–90.0) North America and Australia 13 1562 87.5 88.1 (83.6–91.5) South and Central America 12 1460 89.3 87.7 (83.1–91.2) Histological type Squamous cell carcinoma 47 5825 86.9 87.3 (84.8–89.5) Adeno(squamous) carcinoma 45 1508 76.7 76.5 (72.3–80.3) Unspecified 48 2725 89.0 89.2 (85.1–92.3) HPV DNA specimen Fixed biopsies 34 3324 84.3 83.3 (78.9–86.9) Fresh biopsies 27 3992 88.4 87.8 (84.9–90.2) Unspecified biopsies 8 496 87.1 87.2 (82.3–90.9) Cervical exfoliated cells 13 1444 80.1 78.9 (68.5–86.5) Cells and biopsies 3 802 93.5 92.5 (87.3–95.7) Primers MY09/11 31 4355 85.9 83.3 (80.1–86.0) GP5/6 6 506 80.8 77.8 (64.9–87.0) GP5+/6+ 14 1681 92.2 90.1 (85.0–93.6) SPF10 3 275 96.7 97.2 (87.9–99.4) PU1M/2R 6 376 80.9 79.4 (68.8–87.0) L1C1/C2 5 655 91.2 88.0 (77.2–94.1) Combination 9 1351 88.4 86.4 (77.9–92.0) Other 4 166 84.3 89.3 (75.2–95.9) TS-PCR only 7 693 73.6 74.7 (63.8–83.2) a Adjusted for histological type, region, HPV DNA specimen and PCR primers. ). HPV DNA was significantly less likely to be detected in ADC (76.5%) than in SCC (87.3%) (P<0.001). DNA detection in ICC of unspecified histology (89.2%) was similar to that in SCC. Adjusted HPV prevalence was significantly higher from studies testing both cells and biopsies for HPV DNA (92.5%) than from studies testing either cervical exfoliated cells (78.9%) or fixed biopsies (83.3%) only. For PCR primers, highest HPV prevalence was obtained in studies using SPF10 primers (97.2%) and the lowest in studies using type-specific PCR (TS-PCR) only (74.7%). Adjusted overall HPV prevalence varied between 77.8 and 90.1% for other primer sets, but these differences were not statistically significant. Meta-analysis of HPV type-specific prevalence Owing to their similar overall and type-specific HPV prevalence, ICC of unspecified histology were combined with SCC for comparison of HPV type-specific prevalence by histological type (Figure 1 Figure 1 Type-specific prevalence of HPV in 10 058 worldwide cases of invasive cervical cancer by histological type. ). The most common HPV types identified were, in order of decreasing prevalence, HPV16, 18, 45, 31, 33, 58, 52, 35, 59, 56, 6, 51, 68, 39, 82, 73, 66 and 70. Other HPV types were detected in no more than 0.2% of ICC cases. There was considerable variation in HPV-specific prevalence between SCC and ADC. HPV16 was identified more often in SCC (55.2%) than in ADC (31.3%) (P<0.001). The same was found for the HPV16 phylogenetically related types 31, 33, 52 and 58 (P<0.001), but not 35. Conversely, HPV18 was more prevalent in ADC (37.7%) than in SCC (12.3%) (P<0.001). The HPV18 phylogenetically related type 45 was also more prevalent in ADC (5.8%) than in SCC (3.4%) (P=0.04). Comparison of HPV-specific prevalence in SCC by region is shown in Figure 2 Figure 2 Type-specific prevalence of HPV in 8550 cases of squamous cell and unspecified cervical carcinoma by region. . In SCC, HPV16 was the predominant type in all regions studied, varying from 45.9% in Asia to 62.6% in North America and Australia. HPV18 was found consistently in 10–14% of SCC cases. In most regions, HPV45 (2–8%), 31 (2–7%) and 33 (3–5%) were the most prevalent types in SCC after types 16 and 18. In cases from Africa, the prevalence of HPV45 (8.0%) was more than twice that of either 31 (2.7%) or 33 (3.2%). In cases from Asia, HPV58 (5.8%) and 52 (4.4%) were found more commonly than HPV45, 31 and 33. Other HPV types varied considerably in their prevalence from region to region, but accounted for no more than 2% of ICC cases from any region. Sufficient ADC-specific data existed for the comparison of HPV-specific prevalence across Asia, Europe and North America and Australia (Figure 3 Figure 3 Type-specific prevalence of HPV in 1508 cases of adeno- and adenosquamous cervical carcinoma by region. ). HPV18 was the predominant type (37.7%), found consistently in 37–41% of ADC cases in these regions, with HPV16 accounting for a smaller proportion (26–36%). HPV45 was the third most prevalent in each region, present in 5–7% of ADC cases vs only in 2–4% of SCC cases from these regions. The HPV16 phylogenetically related types 31, 33, 52 and 58 (but not 35) were all less prevalent in ADC cases than in SCC cases from each region. Discussion Two-thirds of ICC cases included in this meta-analysis were associated with HPV16 (51.0%) or 18 (16.2%) infection. However, more than 16 other HPV types were also associated with ICC, of which the most prevalent were types 45, 31, 33, 58 and 52 (collectively accounting for 18.3% of cases). The HPV16 family of viruses were more commonly found in SCC than ADC, whereas the HPV18 family were more common in ADC. Geographical region Overall detected HPV prevalence varied little between geographical regions (83–89%), but was low compared to the almost 100% HPV prevalence identified in studies using the most sensitive HPV detection methods (Walboomers et al, 1999). This reflects the fact that many studies used HPV DNA detection strategies of suboptimal sensitivity. When comparing prevalence by region and histology, we attempted to take account of alternative HPV DNA sources and PCR primers by adjustment. However, it is not known to what extent other unknown sources of variation such as sample storage conditions, specific PCR conditions and quality of histopathology may affect these comparisons. Residual differences in prevalence between regions could also be because of the yet unknown HPV types not amplified by the existing PCR primers. There were many similarities in HPV type-specific distribution across the regions studied. In SCC, HPV16 was clearly the predominant type varying from 45.9% in Asia to 62.6% in Europe, with HPV18 being found consistently in 10–14% of the cases. Other rarer types appeared to vary in their distribution. In most regions, HPV45, 31 and 33 were the third, fourth and fifth most common genotypes, although not necessarily in that order. Asia appeared to be different with a larger proportion of cancers associated with HPV58 and 52, as highlighted by a recent study in China of 786 cases in which HPV58 and 52 were the third (10%) and fourth (9%) most common genotypes in ICC (Wong et al, 2000). Other types in SCC were too rare to make inferences on region-specific variations. Histological type of ICC This meta-analysis shows that overall HPV prevalence detected in ADC was significantly lower than that detected in SCC. This intriguing finding does not appear to be because of differences with respect to region or HPV detection methods as it persisted even after adjusting for these factors. ADC arises from tissue deeper in the interior of the cervix uteri than SCC, and it has been reported to be more difficult to appropriately sample exfoliated cells of ADC than SCC (Sasieni and Adams, 2001). However, most HPV detected in the present review was based on biopsy specimens (77%). A proportion of cervical ADC could be misclassified ADC arising from the endometrium or other rare histological variants of ADC, for example, clear cell and mesonephric, which have been suggested to be HPV-independent (O'Leary et al, 1998; Pirog et al, 2000). Whereas HPV16 was the most common type in SCC followed by HPV18, the situation was reversed in ADC where HPV18 was the most common type, followed closely by HPV16. This difference has been described independently by many of the studies in this analysis and by studies outside the scope of this review (IARC, 1995). Compared to HPV16, HPV18 has been shown to be associated with increasing oncogenic potential in cell culture (Barbosa and Schlegel, 1989), as well as a more rapid transition to malignancy (Burger et al, 1996) and a poorer prognosis of cancer patients (Nakagawa et al, 1996; Hildesheim et al, 1999; Schwartz et al, 2001). Given the fact that columnar tissue giving rise to ADC is less accessible, and possibly less susceptible to HPV infections, than the squamous tissue of SCC, the establishment of ADC may require a relatively more aggressive infection. In addition to HPV16 and 18, this large meta-analysis facilitated the identification of differences for some rarer phylogenetically related types: the HPV16-related types 31, 33, 35, 52, and 58 were more prevalent in SCC (15.0% collectively) than in ADC (4.4% collectively); and HPV18-related 45 was more prevalent in ADC (5.8%) than SCC (4.2%). All these differences were seen consistently in all regions where the comparison was possible. For all regions where histological comparison was possible, the ratio of ADC to SCC was higher than that reported by cancer registries (Parkin et al, 1997). For example, ADC represent 23.1% of histologically verified cases from Europe in this study, but only 15.3% of ICC cases reported to European cancer registries (Parkin et al, 1997). Since all seven studies of only ADC cases were from Europe, Japan or USA, ADC is over-represented in this meta-analysis, particularly in developed countries. No material differences in results were observed when SCC was compared with cancers of unspecified histology. Study limitations The different PCR primers employed by the studies covered in this analysis varied in their overall detection of HPV DNA, with the highest prevalence being obtained with SPF10 and GP5+/6+ primers, supporting findings from previous studies (Davies et al, 2001). Such variation is partly because of known differences in the range of HPV DNA types amplifiable by each primer set, and this was taken into consideration when estimating type-specific prevalence. However, there is also evidence that not all primer sets amplify individual HPV types with the same sensitivity (Qu et al, 1997; Kleter et al, 1999), and such differences are a potential source of bias in this analysis. The type-specific prevalence reported for each individual type includes that in multiple infections, which were reported in a total of 3.7% of our ICC cases. Since many of the included studies tested for only a subset of HPV types, many multiple infections will have been missed. Hence, this meta-analysis was unable to estimate how often individual HPV types were found in the presence of other types, which limits the conclusions that can be made about individual HPV-type oncogenicity. In particular, a large proportion of cases positive for HPV6, which is not thought to be oncogenic, may be coinfected with an undetected HR HPV type. The cases included in this meta-analysis are not representative of the worldwide distribution of ICC. The proportion of cases contributed by Africa (6.1%) and Asia (30.7%) in this study under-represent their proportional burdens of worldwide cervical cancer, which are 14.1 and 49.4%, respectively (Parkin et al, 1999). In contrast, the proportion of cases contributed by Europe (33.2%) and North America and Australia (15.5%) over-represent their proportional burdens, which are 15.7 and 4.4%, respectively. Adjustment of type-specific prevalence in all ICC cases (Figure 1) by weighting each region according to their cancer burden, however, did not materially effect the results, highlighting the general similarity of HPV-type distribution across regions (data not shown). Furthermore, the cases in this meta-analysis were not drawn uniformly from across each region. Large areas have not been included (e.g., the Middle East and Indian subcontinent in Asia), while other specific populations such as Japan in Asia are over-represented. There is also evidence of inter-regional variation in HPV-type distribution; the high prevalence of HPV52 and 58 in Asia is more apparent in cases from China/Korea/Japan than in those from South East Asia. Hence, for the comparison of alternative regional groupings, HPV-specific prevalence is presented by study in the Appendix (Table A1). Given that HPV is considered a virtually necessary cause of ICC, we further examined results restricted to HPV DNA-positive cases. This increased type-specific prevalence by a factor of ≈1.1 consistently for each HPV type, with no impact on the relative distribution of HPV types. However, given that many of the PCR systems used by the included studies amplify only a subset of HPV types, many HPV-‘negative’ cases may actually be infected with other, unascertained, HPV types. Thus, we did not consider it appropriate to restrict to HPV-positive cases when comparing type-specific prevalence across studies where PCR methodology differed considerably. However, in order to make a broad overall estimate if one does assume that, HPV DNA should be detectable in 100% of ICC and that the distribution of undetected types in HPV-negative cases is similar to that in positive cases, this meta-analysis suggests that vaccinating against HPV16 and 18 should prevent over 70% of worldwide ICC. However, a worldwide vaccine against only HPV16/18 may prevent a larger proportion of ICC in Europe, North America and Australia (≈75%), than in Africa, Central and South America and Asia (59–64%), where a larger proportion of ICC cases were associated with other HPV types. Although this study identifies at least 18 HPV types associated with ICC from around the world, the most important type after HPV16 and 18 appears to be HPV45, followed by types 31, 33, 58 and 52, the relative importances of which vary by region. Obstetric outcomes after conservative treatment for intraepithelial or early invasive cervical lesions: systematic review and meta-analysis. 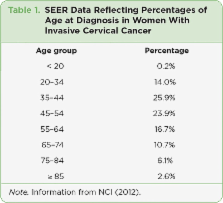 Conservative methods to treat cervical intraepithelial neoplasia and microinvasive cervical cancer are commonly used in young women because of the advent of effective screening programmes. In a meta-analysis, we investigated the effect of these procedures on subsequent fertility and pregnancy outcomes. We searched for studies in MEDLINE and EMBASE and classified them by the conservative method used and the outcome measure studied regarding both fertility and pregnancy. Pooled relative risks and 95% CIs were calculated with a random-effects model and interstudy heterogeneity was assessed with Cochrane's Q test. We identified 27 studies. Cold knife conisation was significantly associated with preterm delivery (<37 weeks; relative risk 2.59, 95% CI 1.80-3.72, 100/704 [14%] vs 1494/27 674 [5%]), low birthweight (<2500 g; 2.53, 1.19-5.36, 32/261 [12%] vs 905/13 229 [7%]), and caesarean section (3.17, 1.07-9.40, 31/350 [9%] vs 22/670 [3%]). Large loop excision of the transformation zone (LLETZ) was also significantly associated with preterm delivery (1.70, 1.24-2.35, 156/1402 [11%] vs 120/1739 [7%]), low birthweight (1.82, 1.09-3.06, 77/996 [8%] vs 49/1192 [4%]), and premature rupture of the membranes (2.69, 1.62-4.46, 48/905 [5%] vs 22/1038 [2%]). Similar but marginally non-significant adverse effects were recorded for laser conisation (preterm delivery 1.71, 0.93-3.14). We did not detect significantly increased risks for obstetric outcomes after laser ablation. Although severe outcomes such as admission to a neonatal intensive care unit or perinatal mortality showed adverse trends, these changes were not significant. All the excisional procedures to treat cervical intraepithelial neoplasia present similar pregnancy-related morbidity without apparent neonatal morbidity. Caution in the treatment of young women with mild cervical abnormalities should be recommended. Clinicians now have the evidence base to counsel women appropriately. The extent of cross-protection is a key element in the choice of human papillomavirus (HPV) vaccine to use in vaccination programmes. We compared the cross-protective efficacy of the bivalent vaccine (HPV 16 and 18; Cervarix, GlaxoSmithKline Biologicals, Rixensart, Belgium) and quadrivalent vaccine (HPV 6, 11, 16, and 18; Gardasil, Merck, Whitehouse Station, NJ, USA) against non-vaccine type HPVs. We searched Medline and Embase databases, conference abstracts, and manufacturers' websites for randomised clinical trials assessing the efficacy of bivalent and quadrivalent vaccines against persistent infections (lasting ≥6 months) and cervical intraepithelial neoplasia (CIN) associated with the non-vaccine type HPVs (types 31, 33, 45, 52, and 58). We included studies of participants who were HPV DNA negative before vaccination for all HPV types assessed. We assessed heterogeneity in vaccine efficacy estimates between trials with I(2) and χ(2) statistics. We identified two clinical trials (Females United to Unilaterally Reduce Endo/Ectocervical Disease [FUTURE] I and II) of the quadrivalent vaccine and three (Papilloma Trial Against Cancer In Young Adults [PATRICIA], HPV007, and HPV-023) of the bivalent vaccine. Analysis of the most comparable populations (pooled FUTURE I/II data vs PATRICIA) suggested that cross-protective vaccine efficacy estimates against infections and lesions associated with HPV 31, 33, and 45 were usually higher for the bivalent vaccine than the quadrivalent vaccine. Vaccine efficacy in the bivalent trial was higher than it was in the quadrivalent trial against persistent infections with HPV 31 (77·1% [95% CI 67·2 to 84·4] for bivalent vaccine vs 46·2% [15·3 to 66·4] for quadrivalent vaccine; p=0·003) and HPV 45 (79·0% [61·3 to 89·4] vs 7·8% [-67·0 to 49·3]; p=0·0003), and against CIN grade 2 or worse associated with HPV 33 (82·3% [53·4 to 94·7] vs 24·0% [-71·2 to 67·2]; p=0·02) and HPV 45 (100% [41·7 to 100] vs -51·9% [-1717·8 to 82·6]; p=0·04). We noted substantial heterogeneity between vaccine efficacy in bivalent trials against persistent infections with HPV 31 (I(2)=69%, p=0·04) and HPV 45 (I(2)=70%, p=0·04), with apparent reductions in cross-protective efficacy with increased follow-up. The bivalent vaccine seems more efficacious against non-vaccine HPV types 31, 33, and 45 than the quadrivalent vaccine, but the differences were not all significant and might be attributable to differences in trial design. Efficacy against persistent infections with types 31 and 45 seemed to decrease in bivalent trials with increased follow-up, suggesting a waning of cross-protection; more data are needed to establish duration of cross-protection. Public Health Agency of Canada. Copyright © 2012 Elsevier Ltd. All rights reserved. This is an open-access article distributed under the terms of the Creative Commons Attribution License, which permits unrestricted use, distribution, and reproduction in any medium, provided the original work is properly cited and is for non-commercial purposes. Screening for Human Papillomavirus-Associated Cervical Disease in HIV-Infected Women. Cervical abnormality and sexually transmitted disease screening in human immunodeficiency virus-positive women.